OH SO ROMANTIC! 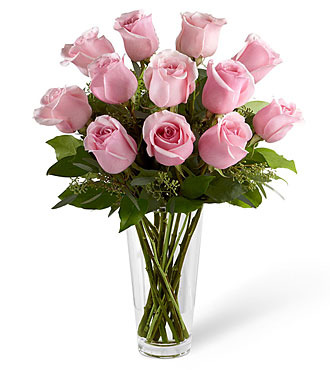 12 long stem baby pink roses elegantly stretch froma clear glass vase of greens. 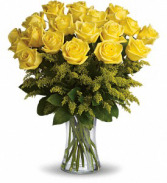 Price 2= 18 roses for a fuller look, and more delight! So much to love with these peachy roses! 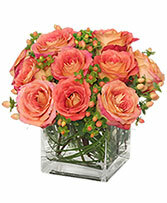 Designed in a glass vase (round or square) peppered with awesome peach hypericum berries, and fun foliage. Winner! (Nature makes her peach in shades from coral or pale peach, to nearly orange, we choose the nicest in stock for you!) At Breitinger's /flowers our roses are TheFreshest! Aaaaa-dorable!! Knitted and stitched with high quality, go ahead, buy it in Add-On at check out. 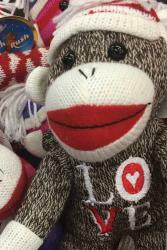 No one's too sophisticated to fall in love with this little guy, he'll make remember her flowers all year long.